For those who have seen the previous post, you already know that I had been scrambling to find a new solution to making movement trays without any sculpey. The pink foam had actually worked! 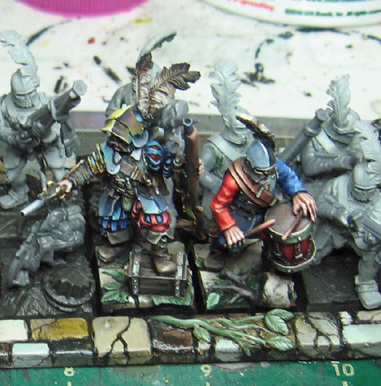 With the glue sealer, it was very sturdy, and I had sculpted the extra green stuff bits to match the original bases. Now it was time to paint it! I began with a very generic yellow ochre just to cover the entire surface. I used a few different lighter colors to indicate where I wanted different colors of stones... some cooler, some warmer. Once that was established, I decided to test out some new Secret Weapon washes that I had been given as prize support for Bilbo's Bash. I had a black, a dark sepia, and a concrete. Those last two were very interesting, in that they were opaque. It reminded me of some of my washes made by watering down the old GW foundation paints. This brings up an important point. I am perpetually experimenting with new materials and techniques. Sometimes it is out of necessity, like the pink foam, but I will also test out a new idea or material just to see what may happen. This can generate some anxiety, to say the least, but it has advanced my abilities exponentially. I can honestly say that the way I paint will be different by the end of this week than when it started. It can change dramatically... almost instantly. Not only does this keep things interesting, it allows me to do a whole lot more in a lot less time! Back to the painting... I have completed the darker washes and glazes, so now I start getting back to highlights and working the middle tones. I try to smooth out some of the rougher areas (especially in that all important middle tone). The first layers of colors appear on the foliage. I highlight the foliage to match what I had done on the previous bases, and start painting in some cracks. I used a very fine brush to paint in cracks that were even smaller than the ones I had sculpted into the foam. The figures are placed back on to the tray to see how things are looking! Nice; looks like it turned out really well! Thanks! When experiments work, it is always more fun! !